GRIN AND BARRETT: GOING TO D.C.! So the time has finally arrived for me to do something really "big boy" - an internship. 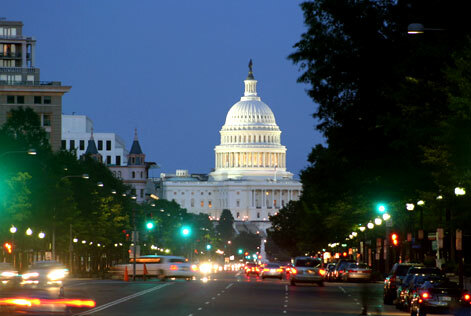 On somewhat of a whim, I decided to apply for an internship in Washington, D.C. for the spring of 2010. What I thought would be a simple "yes/no" response was really a triple-interview extravaganza that left me absolutely certain that I had no future. First interview I've had since applying for the job I currently have. I felt rather confident, however, because I had some connection with the interviewer. My sister-in-law's brother had been an intern for the interviewer, so I could at least mention a name. Overall, this interview went ok...probably a 7 out of 10. Two interviewers. Unexpected questions to which my answers were probably more unexpected. I hadn't done much homework before this interview, which left me yearning to turn back time to get ready. Of the three interviews, I felt like this was my least impressive. "Well," I thought, "at least I have one more today." I walked into the building feeling prepared. I had used the previous two interviews as templates for the third. I asked myself questions, I read up on issues, I practiced my answers...no sweat. There was nothing impeding me from having a stellar interview. THREE interviewers. They asked me some of the classic questions to which I gave probably classic answers. The bulk of the interview was spent listening to one man give a description of what the interns in that office do. When I began to feel like I really had made a good impression, the handed me a paper that became, I believe, the reason for my rejection. They expected me to respond to a fake letter concerning the public option in health care. After 15 minutes of stumbling my way through poor writing, I gave up. I handed in my letter and walked shamefully across campus. After the third interview was over, I felt defeated. I couldn't believe I had blown all chances of interning in D.C. After reading my rejection letter from Senator Bennett's office, I gave up hope. In the end, everything turned out wonderfully. Apparently the stars aligned that day and Jason Chaffetz's office accepted me for the spring. I'm going to Washington! I heard and so therefore here are my Congrats!!! Have you decided what semester you will be leaving?! Yes! When are you going? WHAT!!!?!?! That's so awesome Brady! How long will you be leaving us? CONGRATULATIONS!!! We're celebrating for you in Iowa! We are eating pumpkin bars in your honor. They're delicious. What ever happened with Hatch's office? See you in a COUPLE DAYS!!! Well, Michelle and Kylee at least. Brandon will D.C. you later... ha ha Brent would love that. Wow, Michelle...that was a classic dad joke...good job!!! We are super excited for you and hope that we can soon be eating pumpkin bars in your honor...Michelle will you send us some?